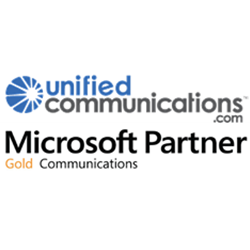 Home → News → We're proud to achieve our Microsoft Partner Gold Communications Competency. UnifiedCommunications.com, a Lync-focused Microsoft value-added distributor (VAD), today announced that it has attained a Microsoft Gold Communications Competency, demonstrating a “best-in-class” ability and commitment to meet Microsoft Corp. customers’ evolving needs in today’s dynamic business environment and distinguishing itself within the top 1 percent of Microsoft’s partner ecosystem. To earn a Microsoft Gold competency, partners must successfully complete exams to prove their level of technology expertise, and then designate their Microsoft Certified Professionals uniquely to one Microsoft competency, ensuring a certain level of staffing capacity. They also must pass other qualifying assessments.